This week, we have a look at three more interesting cruises away from the crowds and the big ships, on ships of a certain size with refined and relaxed atmospheres and a total abscence of cartoon characters, ships that remind one of the golden age of cruising. So today we investigate cruising the Caribbean in Seabourn Quest, Atlantic Europe in Le Boréal and the Mediterranean in Azamara Quest. We also examine the 2012 issue of “Stern’s Guide to the Cruise Vacation,” just out. And the latest statistics from the German DRV reveal a very successful year in German cruising, with 1.2 million cruisers. 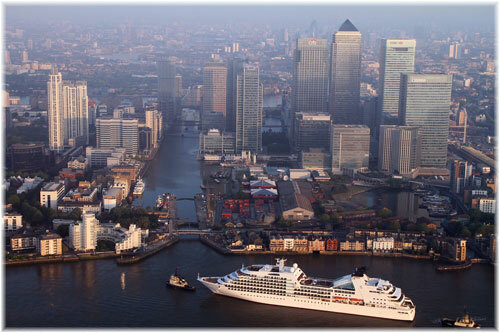 Within a few years the German cruise market will probably surpass the UK’s in size. 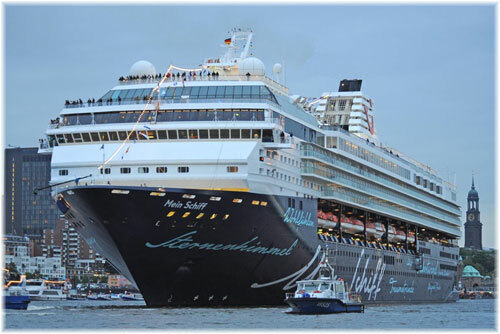 For those who have been cruising for many years, one of the worst things about the recent huge growth in cruising has been its new mammoth ships with the massive crowds they bring. For the many who dislike crowds, overweaning entertainment, ziplines, Blue Man Group and Red Frog beer, here are three cruises that will take you away from all that to explore areas of real interest. And as we are also having a look at “Stern’s Guide to the Cruise Vacation” this week we will quote his strong points for each line as well. Now that Seattle-based ultra-luxury line Seabourn has all three of its larger 450-guest luxury ships, Seabourn Odysssey, Sojourn and Quest, in service, its fleet numbers 1,986 berths, including the original trio of Seabourn Legend, Pride and Spirit. A threefold growth in capacity over two years means that Seabourn now offers more berths than and twice as many ships as its predecessor Royal Viking Line when it operated its original trio of ultra-luxury ships on itineraries worlwide. In fact, today’s Seabourn offers much better value on board as it is all-inclusive, whereas on Royal Viking one had to pay for one’s bar bills, wines and gratuities. For a Caribbean cruise on Seabourn, one couldn’t do better than to choose the Seabourn Quest, which made her maiden North American landfall a week ago when she arrived in Fort Lauderdale. The Quest will typically sail on 10-, 12- and 14-night Caribbean cruises from Fort Lauderdale in November and December, and rather than calling at the mass-market ports of St Thomas, Cozumel and Costa Playa, none of which have any cultural appeal, she calls at out-of-the-way islands that are for the most part off the beaten track. Typical calls include St Kitts, St Vincent, Mayreau, St Barts and St John as well as the more popular Barbados and Martinique, and usually a call at San Juan as well. The latter is so the Americans can buy their double duty free allowance, but rather than go shopping with them, take advantage of this opportunity to do your own private tours. A verandah suite will cost about £4,500 to £5,000 per person double for a fortnight including flights from the UK. An up-and-coming company in the news of recent is Marseilles-based Compagnie du Ponant, which has introduced two 264-guest yachtlike ships, Le Boréal and L’Austral, over the past couple of years, and has just ordered a third. 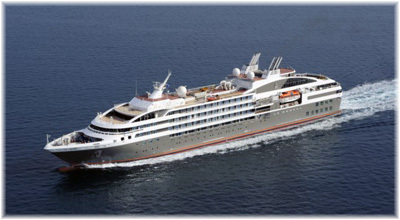 The recent sales of Le Levant to Paul Gauguin Cruises and Le Diamant to buyers affiliated with International Shipping Partners means that its fleet will become more uniform, with three new sister ships and the original 60-berth Le Ponant, which took the company name and is now becoming more of a mascot. For this cruise we nominate Le Boréal’s May 9th Gastronomic sailing from Honfleur to Copenhagen by way of Ostend, Amsterdam, Hamburg and the Kiel Canal. On this 5-night sailing three top chefs, Michelin three-star Jacques Marcon, two-star Jean-Marc Delacourt and Philippe Joannes, best chef in France of 2000, will be serving up gastronomic delights to match the ports of call. Fares start at £1,304 per person double occupancy. For those who like to combine business with pleasure Ostend is called at on Thursday and Amsterdam on Friday if you want to make appointments, but Hamburg will be called on Saturday so you can go and see the Maritime Museum. 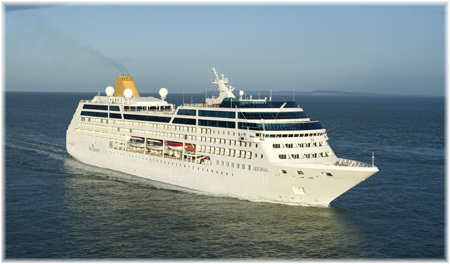 The cruise is only five nights but with such chefs on board perhaps that is enough at one go. Another interesting cruise that avoids crowds and offers little extras is Miami-based Azamara Club Cruises, whose Azamara Quest cruises the Mediterranean by summer and autumn. Obe can join this Quest on August 18 at Venice for an overnight stay before sailing at 6 pm on the 19th for visits to Split, Dubrovnik, Kotor (an overnight stay), Brindisi, Corfu, Taormina, Amalfi (another overnight stay), Capri and Sorrento before finishing in Civitavecchia for Rome on August 29. Cruise-only balcony fares begin at £2,709 and include fine boutique wines with lunch and dinner and a focus on culture and destinations on a ship that carries no more than 684 passengers. 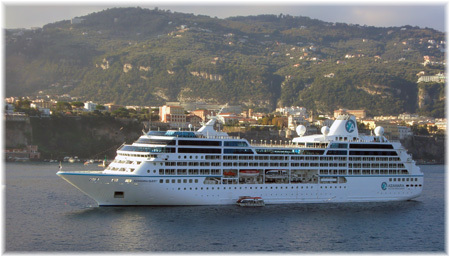 The Quest and her sister ship Azamara Journey were once members of the Renaissance fleet. There is not a single trace of Shrek, Spongebob Squarepants or Mickey on any of these ships. Just a sense of calm and sophistication, where larger ships need to have Retreats, Sanctuaries and Tranquility areas to get away from the endless activity. Such areas are not needed on the better ships. This is a great advantage for Europeans, as the ships are all now listed (for a few years now) although not graded. There are some anomalies though. Though P&O ships are all listed only the Adonia is graded, presumably from her previous incarnation as Princess Cruises’ Royal Princess. Aida Cruises is listed in the main body while TUI Cruises is listed under “Miscellaneous Additional Cruise Lines.” Easycruise is still listed although they no longer have a ship, the Hebridean Spirit is still listed, while she has been gone for well over a year, Louis is still listed as having Ausonia and Princess Cypria in service while they have also been gone for more than a year, Page & Moy is listed with four ships but they have given up chartering cruise ships and Pullmantur’s Sovereign is listed as Moon Empress. So the listings could be helped by having a European correspondent to keep them more up to date. The guide comes to 736 pages this year, two fewer than last (Berlitz is 688), of which fully 407 pages are devoted to ships and their scoring. Some of the big advantages of the Stern guide are that it displays typical menus and daily programs for the major cruise lines and also has summaries in the back for the biggest suites, with comparisons by ship and square footage, and reports on alternative dining venues.along with typical menus. Also, many of the major river lines are covered, something that does not happen in Berlitz. And finally, Stern also contains details on port and destination information. All in all, a very useful tome, not only for first-time cruisers, but also the veteran. Stern’s weak point? The book comments on each line’s strong points but does not mention its weak points. To be fair, however, the Berlitz Guide tried to point out weak points a few years ago. Do you remember around 1999 when the last paragraph for each ship started with an underlined “but”? so it had to give up on that practice, presumably under irresistable pressure from the cruise lines. The Deutscher ReiseVerband (DRV) has recently announced German tourism statistics for the year ending October 31 and they have been very good. 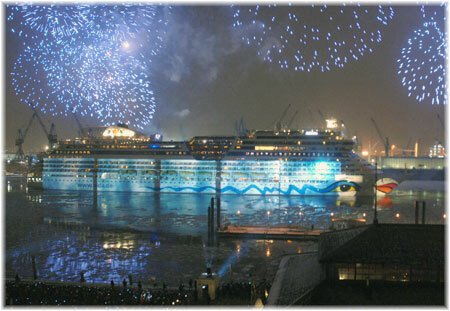 A significant growth rate of 18.9% has been achieved in the German ocean cruise market, with Aida Cruises having added a ship a year for each of the past five years and TUI Cruises having doubled its fleet this year, to reach 1,219,473 passengers and 432,766 river cruise passengers. Germany’s ocean cruise revenues exceeded €2 billion for the first time, while river cruise operators generated €472 million. That that more than 1.2 million Germans took an ocean cruise confirms it as the second largest European market after the UK’s 1.62 million. But if one adds the 430,000 German river cruisers and 134,000 British river cruisers to these figures, the resulting German total of 1.65 million is very close to the UK’s 1.75 milllion. The two countries are very close to par on this basis, with Germany almost at 95% of the UK’s market size. On the ocean side, Carnival’s Aida brand, now standing at eight ships, introduced the 2,174-berth AidaSol this year and in 2012 will add sister ship AidaMar. More significantly, however, Aida has recently ordered two 3,250-berth 125,000-ton cruise ships from Mitsubishi for delivery in 2015 and 2016. By this time or shortly thereafter the German market may well surpass the UK in size. In the meantime, TUI Cruises has successfully introduced its 1,870-berth Mein Schiff 2, sister ship of Mein Schiff, while upmarket TUI affiliate Hapag-Lloyd Cruises is building a new Europa 2, while Oceania’s Insignia will become Columbus 2 next April. Newcomers to the German market next year will include Ambiente Cruises, with the Princess Daphne, and FTI, with the FTI Berlin.